I’ll definitely be trying this recipe out – I love one pan recipes and thai flavours! It must be really quick to make if you use leftover rice from the day before (fabulous). It’s funny thing but you prompted me to check when my first post was too and it was January 17th 2007 last year – I’ve completely missed my first anniversary too! Happy Birthday to your blog! Congratulations, and here is to the second year of delicious food. This looks like a great recipe – I’m sadly allergic to shellfish, but think I could try something similar with chicken. Congratulations Wendy – it’s been a good year of blogging and I look forward to another year of your fine foodie posts! I checked out the original post and it is nice to have an update with a photo – I love the fragrance of thai cooking but wish there was less fish and more vegies! Oh well, enjoy looking at your photos! Antonia – Thank you! It’s really great with chicken too. A good way to use up leftovers. Happy blog birthday and many more to come. This does sound like a great recipe. Happy Blog Birthday Wendy! I have really enjoyed ready your blog for the best part of the last year, I didn’t get into the swing of things till April! I hope you have lots more blog birthdays! Wendy, it is Lucas’ birthday today too, so happy birthday to your blog as well. 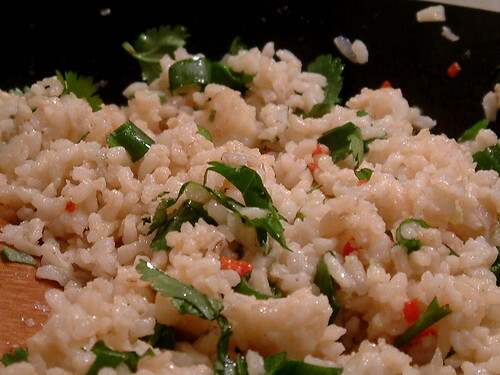 The boys like rice so I shall try this recipe out with them but probably will skip the chilli. Love S.
Holler – Hope I’ve helped you to remember your anniversary! Happy Birthday to your blog! I am bookmarking this recipe, I love everything thai! And a great looking rice dish…. You know, darls, I don’t think my blogging life would be complete without A Wee Bit of Cooking. And, of course, the lovely you. Spent an afternoon a few months ago going back through your archive and it makes fascinating reading. Beautiful recipe – those Thai flavours make my mouth water. How could I ever be a ‘proper’ vegetarian? I love fish sauce – there’s nothing to match it! Thanks for the rice link…break open a bottle of something ‘cos there’s a lot of work involved in getting to 12 months worth of posting. Very happy birthday-a-versary to you and your blog. I hope you’re as pleased as the rest of us to have started your blog – may there be many more great recipes and wonderfully told stories to come. It flies by Wendy! Just over a year for me. And I like you am terrible at remembering. So happy belated! Happy blog-versary Wendy!! It hardly seems like a year has gone by already. Cheers to another year of great posts!! Happy birthday, I’ve been reading your blog for a couple of months and I love your photos- I’m really hungry now even though it’s nearly midnight. I was wondering did you do the Gordon Ramsay cook-a-long on Friday? That was me before…lucindadodds…sorry for the confusion. I was playing with WordPress last week and…well…it was fun for a while! Congratulations on your first year of Blogging Wendy!!! And thanks for the yummy recipe. I think it may well become a fav here too just like your Tom Yummish soup!!! Happy first blogversary up there in the land of snow and great produce. Happy birthday, Wendy! It’s always a pleasure to read your blog. Pam – Thank you! Promise it won’t disappoint! Annemarie – I really am so glad I started it. It took a while to take shape, mind you! Jane – Hello! I didn’t actually. Had guests up, no TV in the kitchen and am not a lover of scallops. It was all against me! Happy Blog Birthday Wendy, and here I am better late than never! Oh my gosh, if you are at one year, I am close behind! Seems like only yesterday and I DO remember reading your “other blog”!!! My how time flies! Happy Blog-iversary, Wendy. Your blog is such a great addition to my webworld. I’m happy to gotten to know you virtually this year and look forward to many more years of reading your work. Thanks for making my life a little broader. Susan – 🙂 Thank you!